We offer Decorative Paintings that includes Calligraphy Painting, Oil Painting, Modern Art Painting, Tanjore Painting, Cultural Painting, Relief Work Painting, Acrylic Painting, Geometrical Design etc. Calligraphy is the creative form of harmonious, skilful and expressive writing. Our adroit artists offer the Calligraphy Painting with finesse and elegance. The calligraphers have immense talent and hence can give language even to abstract beauty. We make use of the finest paper, ink and brush to offer Calligraphy Paintings that are perfect blend of excellence and virtuosity. With the depth of thoughts, we bring forth Oil Paintings that are made using best lubricated paints and material. The oil painting is known for its gloss and shine which turns a normal image into a real picture. The style varies from artists to artists but certain steps are followed by every artist. Our range of oil painting ranges from abstract to mythological. Each painting offered by us in special packaging like in 24 carat gold foil & gold foil. We are thrilled to offer our clients a collection of Modern Art Painting which enhances the ambiance of the interior as well as captivates the mind of the viewer at first sight. Our offered modern paintings can kindle one's imagination through their use of vivacious colors and imaginative depiction of figures and objects. The contemporary styles and themes of our offered paintings, exhibit the zenith of artistic creations. Our ability to provide modern art paintings in different themes, color and sizes as per clients' requirements in special packaging like in 24 carat gold foil & gold foil has made us one of the preferred modern art painting manufacturers of the country. To beautify the interior décor, our clients can avail from us an assortment of Tanjore Paintings. Tanjore (or Thanjavoor) artwork is one of the aboriginal art forms for which India is highly acclaimed. These paintings are notable for their embellishments in the form of precious and semi-precious stones as well as relief work which provides a three dimensional effect. As the art form flourished at a time when gorgeous looking temples were being constructed by the rulers of various dynasties, the paintings were mostly consisted of Gods and Goddesses and we also providing special packaging for the painting in 24 carat gold foil & gold foil. Following the tradition, our artisans paint the portrays in which figures are large and faces are round and divine. Owing to their outstanding craftsmanship, our artists can provide the paintings as per the specifications of our clients. To provide an enchanting aura to the interior decoration, we are providing an excellent range of Cultural Painting. These paintings celebrate the primitivism of various obscure culture of the country. Our talented artisans make these paintings with their imaginative powers and deep knowledge about various cultures. These paintings are widely appreciated for their depiction of enchanting designs and charismatic moods. The magic spelled by our painters is appreciated by all our customers. The Acrylic Painting can be made in any designs, shape and form with unique expressions. The colors are thoughtfully chosen by our painters to express infinite emotions. We make these paintings available at cost effective prices. Ceramic sheets are used to get fine results. To give more bold appearance to our designs, embossing is also done. Colors, tones and shades when added on a painting thoughtfully, can make one lead the path of serenity. Our Relief Work Painting is extremely soothing and makes our customers feel happy. 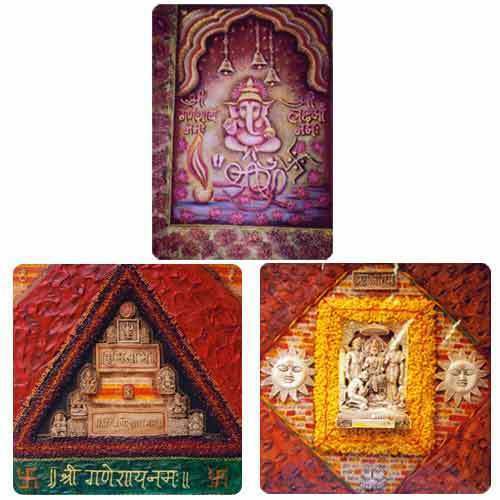 With appropriate usage of colors, and mesmerizing designs, these paintings are available in various shapes and sizes at industry leading prices.